Amen! Preach it, brother! Testify! Take note of the soy lecithin (highlighted). Derived from soybeans, soy lecithin is a natural, safe emulsifier–an additive that lends stability to foods. 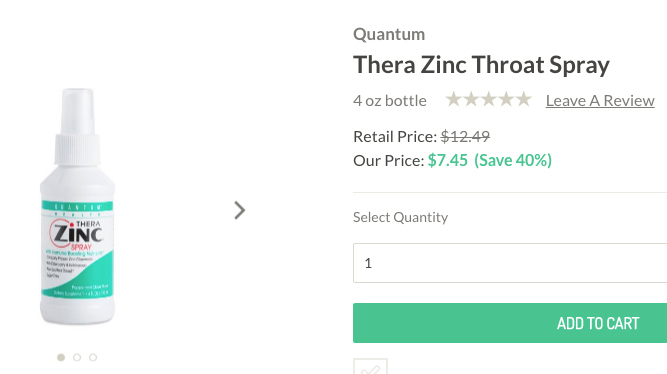 The problem for Thrive Market is that almost all soy produced in the United States is genetically modified.3 A quick phone call to Quantum’s customer service department confirmed that the soy in many of their products, including the throat spray sold by Thrive is, in fact, GMO. So Thrive Market’s promise of a GMO-free store falls as flat as an Olympic pole vaulter who didn’t realize his shoestrings were tied together before setting off on his run. Thrive Market is selling products with ingredients derived from GMOs. More importantly, Thrive and their misinformed organic backers are intent on ridding the world of GMOs in their entirety, no matter what product they’re found in. The anti-GMO zealots are horribly wrong about the effect that genetically modified crops have on the environment, wanting them to be removed entirely. Actually, there are ways in which GMOs are beneficial. For example, farmers who grow Bt corn are able to use less pesticides. Regardless, it’s rather dishonest of Thrive to demonize a perfectly safe crop production method, then sell products derived using that same method to their customers. And, having said this, we must pause and state in the strongest possible terms that there is nothing harmful in Quantum’s zinc throat spray. This is just another small business trying to eke out a living that, unfortunately, got caught up in the tangled web of a $39 billion organic food industry using fear to market their products as “better”. There’s nothing superior, in any way imaginable, about organic products compared to their GMO counterparts. However, Quantum did tell me that they hope to eventually switch over to non-GMO soy. This saddens me. Yet another company bows to the irrational demands of a public that doesn’t realize how easily they’re being manipulated. Alert label readers may have noticed the company’s misspelled “Proplylene Glycol” [sic] next to the soy lecithin on the product label. They’re actually talking about propylene glycol, a harmless additive with a wide range of uses, including as surfactants and preservatives. Woe unto Thrive Market, however, as they label propylene glycol as a dangerous endocrine disruptor in another of their hilariously bad scare pieces. In “Five Simple Pro Tips for Perfect Skin”,4 author Lauren Whitehouse warns readers to not allow “toxic” propylene glycol to touch their skin via cosmetics. Yet we now find Thrive Market literally trying to shove this so-called poison down our throats. Well, OK, spray it down our throats. Don’t worry though: just like GMO soy, propylene glycol is harmless. As intimated by Pinocchio in the opening graphic, Thrive and their backers aren’t exactly behind honest with us. From whence comes so much of Thrive Market’s bad science and resulting hypocrisy? One culprit seems to be the pseudoscientific Environmental Working Group, a special interest group that does no real research but is oft-cited by Thrive as a scientific authority. It turns out that EWG may have more of a financial stake in Thrive and other organic markets than meets the eye. Check back tomorrow, and I’ll start laying it out for you. Thrive and Quantum product/screen snapshots are used in strict accordance with Title 17 U.S.C. Section 107, commonly known as “fair use law”. This material is distributed without profit with the intent to provide commentary, review, education, parody, and increase public health knowledge. Pinocchio and Wheel of Fortune meme characters are used under parody provisions of Title 17 U.S.C. Section 107, commonly known as “fair use law”. This material is distributed without profit with the intent to provide commentary, review, education, parody, and increase public health knowledge. This entry was posted in Alternative Medicines, Health, Medicine, Skepticism and tagged debunked, environmental working group, EWG, gmo, health, soy, thrive market, zinc by Mark Aaron Alsip. Bookmark the permalink.